Écrit à la première personne, cet intense récit sonde un nom propre et ravive, dans son sillage, un imaginaire traversé de films aimés, de paysages familiers, de lectures nomades, d’écrits antérieurs. Lampedusa, île de littérature et de cinéma, devenue l’épicentre d’une tragédie humaine. De l’inhospitalité européenne aussi. 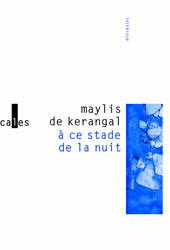 Entre méditation nocturne et art poétique, À ce stade de la nuit est un jalon majeur dans le parcours littéraire de Maylis de Kerangal. One night in October 2013, a woman in her kitchen hear s the name Lampedusa, full of resonance, on the radio. It throws up the face of Burt Lancaster – Italian hero of Visconti’s film The Leopard and the actor in The Swimmer by Frank Perry. Then, in waves and tides, others images emerge : the last days of the Sicilian aristocracy in echo with a Mediterranean drama; the sinking of a migrant boat and its 350 dead. Written in the first person, this intense narrative delves into the significance of a name and its evocations in the same movement, an imagined point of origin criss-crossed by beloved movies, familiar landscapes, nomadic readings and previous writings... Lampedusa, island of literature and cinema, becomes the epicentre of a human tragedy. And of European inhospitality too. Between nocturnal meditation and poetic art, A ce stade de la nuit [At this point of the night] is a major milestone in the career of Maylis de Kerangal.